The year was 2007, I needed to get unstuck and get serious about setting goals for the type of life I wanted to live. The last two years were spent underground inside a basement that was a gym. There was zero natural lighting and to call it “dimly lit” was gracious. I was barely scraping by financially. Time off seemed like an impossibility. The breaking point happened at about 7:54pm on a Thursday night. With the financial meltdown of 07/08 in full effect, in less than two weeks 80% of my clientele was gone. My client that evening was going to pay me cash that was going to be used to buy food. (There was only about $26 in the bank account). At 7:54 pm there was a missed call and voicemail from her. She left a message saying she wasn’t going to make it. My stomach dropped! Standing in the middle of the street there were 1000’s of thoughts and emotions racing through me. Some of these were: feeling pissed, feeling like a failure, and feeling fearful because of the more than $24,000 in debt that I had no clue how to pay off. No matter how much there was a desire to to blame the economy, clients, competition, etc… there was only one commonality here and that commonality was me. My mindset, my focus, my business practices, etc… all of it originated from me and I realized that if I ever wanted to live the lifestyle I wanted to live and more importantly make the positive impact in peoples lives I wanted to make, I HAD TO CHANGE. The big aha: for me to change, I needed to get unstuck and get help (it was apparent that I wasn’t changing on my own). The solution was hiring a Life Coach, as the alternative was to give up on my business and my dreams of helping people. The process was humbling, uncomfortable, and life changing. During coaching, you have confront parts of yourself: your fears and your insecurities that you may not want to. You have to step up and play a bigger game than you have been willing to play before. Fast forward to today. 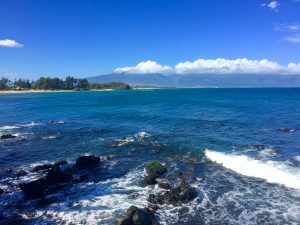 I’ve spent the last week living in Maui, Hawaii. The below photo is from a walk along the cliffs where I discovered this pristine piece of paradise. I’ll be here for another week before flying to Phoenix for a workshop. Then home to Santa Barbara before heading to Las Vegas for Thanksgiving. (Random I know, but why not right? Plus I can only imagine what the buffet’s may be like)! In the small town where I grew up there were not many expectations for success beyond getting involved in the local marijuana industry. Additionally, you needed to make sure you could still go to the Friday night High School football games to talk about the good ole days. The first step was to get out of my own way and let someone help me do what I could not do alone. Perhaps that might be a step you can take today? If you need help or you have any questions, please reach out. I’m here for you! or set up a time to talk using this link.